Since 2001, I have been using comprehensive developmental evidenced-based treatment approach based upon the DIR/Floortime methodology to treat infants, toddlers and older children diagnosed with autism spectrum disorder and other developmental and social-communicative based challenges. A fundamental core part of my practice is to consistently guide you as well as other family members in each session to emotionally understand and connect with your child's natural intent and at each stage cultivate your child's typical Functional Emotional Developmental milestones. 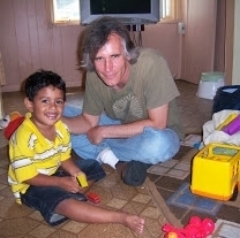 This includes learning how to join in and attribute purpose and meaning to how your child is navigating his/her world; cultivating your child's simple to complex back and forth social-emotional problem solving interactions with gestures and words; simple to complex symbolic play sequences; full social-pragmatic receptive and expressive language and peer relationship skills. Sessions are conducted in the family setting. All initial phone consultations are quite extensive and non-fee based.